Driving is a pleasure; period. But, surely it is not on the any city roads of any metropolis of India. There cannot be anything more chaotic than Indian city roads. 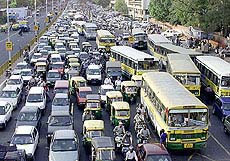 No other country can boast of such a heavy traffic and the host of vehicles of different types and shapes. We have different types of cycles, motorbikes, scooters, autorikshaws, share autos, fishermen carts of strange geometry, lorries, trucks, cars, buses, tankers, bullock carts, jutkas, cycle rikshaws. The last three may not be seen in the city now quite frequently but once in a way you cannot miss them at least during the 'Kanum Pongal' time; one could see nearby villagers throng the city in those carts. As far as traffic rules are concerned, the public give the least respect for them. The cyclists and autos are the worst specimens to create accidents and cause confusion. Most of the cyclists pass through red signal with impunity. The autos are no better. They turn wherever they want, make a lot of noise and prefer to overtake the expensive cars as a matter of prestige. Two wheeler riders are invariably youngsters with extra energy and ego. They snake their way through the waiting or moving traffic caring a damn about their lives and others as well. At times the speed with which they do these acrobatics is breath taking. In other countries, the infrastructure is first developed before some new thing has to be introduced. But in India, we introduce anything first preferably at a low cost and then try for developing the infrastructure which invariably becomes arduous. We find in TV and media every day a new two wheeler or a four wheeler crowd the already congested market and just a phone call will do for the companies and banks to park it in front of your house. The other day someone from Traffic department confided that about 700 licenses are issued on a single day at one particular RTO office. However, can we say the road conditions, its breadth or width and level have improved? Hardly. Most of our roads are bumpy with potholes and patches. Heavy vehicle drivers belong to another category. The sit high and think high. The bus drivers are the miserable souls who have to carry the human sardine packed to the brim. When one goes abroad the first surprising thing is the road manners and the sincere following of rules. There are no two wheelers in most of the developed countries and cycles are mostly used for exercise. Separate lanes are provided for it. There were no horns honked even if there is a long traffic jam. We, Indians would like to enjoy a life of facilities with freedom. We care too hoots for public life and ethics. Surprisingly, the immense growth of two wheelers have not replaced cycles. Launch of multiple designs of cars could hardly remove the two wheelers from the roads. We use our ingenuity to create new and dangerous modes of transport like Share Autos and fishermen carts because we are adventurous lot. When something new and more comfortable comes the old one automatically or in the due course disappears. For example, slides rules and logarithmic tables are totally replaced by calculators. Computers have almost erased typewriters form the market. CDs and pen drives are substituted for floppy disks. But why that is not happening in the case of vehicles and transport? One point is very clear. One can never remove poverty from India. It is not related to money. It is related to the psyche.